Where in the World is Mrs. Fucoloro? : Hey, where's Ben Hur or Russel Crow? Hey, where's Ben Hur or Sparticus? Rome. Wow, how do I describe what I experienced today. First of all, St. Peter's Basilica was stunning. The construction by Michelangelo, the unfortunate expansion, the statues, the mosaics, the various chapels, the floors, the ceilings, the symbolism. I was amazed at it's size and the beauty of the images. I want to go back because I thought we were going to have free time after the tour, but we had free time in the gift shop...coincidence? I would have taken more pictures. Then, we went on a tour of the city on our air-conditioned bus. That is important because it is HOT here. 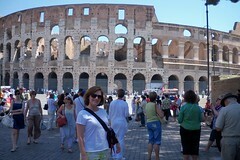 We got out at the Flavian Amphitheatre better known as the Colosseum. Another amazing architectural accomplishment. In some ways it felt like a movie set. I have seen it so many times that much of it seemed familiar. What I didn't understand was the magnitude of its size. How could people in the 1st century AD build something with so grand? The Colosseum seated 50,000 people. Do you know why there are so many holes around the Colosseum? One of the most interesting things about Rome is that when they are building, if they run into a ruin, construction has to stop. Many times you will see that a building is built either above the ruin or right next to the ruin. In the case of being built on top of the ruin, they either have the ruin enclosed in glass or just open to the air. Very interesting. We are told that many Romans leave Rome and head to the beach for the weekends in the summer time. So, we are told that Rome is not too crowded with Romans right now. Tonight is our tour's farewell dinner. Tomorrow morning, we will walk to the Trevi Fountain, and the rest of the day is free until 5:15 when we have a private Vatican Tour. Can't wait!